This is an actual quote we heard from a customer after launching this new SimpleCFS feature last week. Now, whenever an admission LTCMI is submitted without a PL1 already linked to that resident profile, a new alert reminds Texas skilled nursing facilities to complete the PL1.Why is this important? 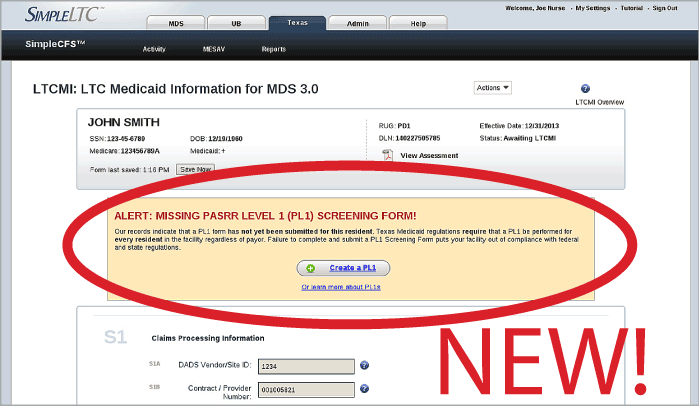 So SNFs can avoid potential regulatory compliance or penalty issues related to PASRR Level 1 (PL1) forms. Texas Medicaid Provider Agreement for Nursing Facility services, Section II, B. 1. and 5. Wouldn’t it be nice to avoid all that? With SimpleCFS you can. We’re proud to continue to improve SimpleCFS to help Texas nursing facilities fully manage their LTCMI and MESAV processes – and, more importantly, to avoid OIG audits, penalties and loss of productivity. You can find more information on our PASRR resources page, including a SimpleCFS training video and links to DADS PASRR information.